This Is How We Know What Love Is: Jesus Christ Laid Down His Life For Us… John, The Beloved. We’ve seen that God made man in His image and placed him outside of Himself even though the ultimate purpose was to join them to His family (Himself). For man to join God’s family He needed to be found blameless & holy (keep in mind that He was made blameless). Adam failed the “blameless and Holiness” test and though it seems like God plans for His priced creation had failed; it was actually moving along the lines of God’s plans due to His foreknowledge. Like Paul said in the scripture above and in also Eph 1:5, when the appointed time had come, God send His son to complete the work needed to join man into His family. This was the plan from the beginning before the world was even created. Jesus was not a Plan B. 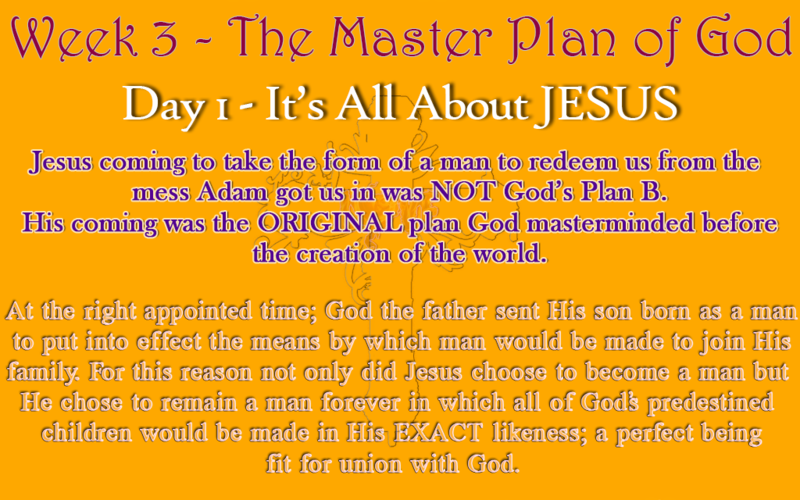 He Is THE PLAN; the original plan God masterminded before Adam was even created. SELAH: If Jesus coming was JUST to redeem us from the mess Adam got us in then what need does Jesus has to remain human (new man) after His resurrection? Maybe that was the price for choosing to become a man. Who knows. But if God could limit Himself to human likeness then it sure is nothing for Him to return to His former glory. So it is more likely that He chose to remain a man forever in accordance to His eternal plan and purpose; which was through Him man will be made in His EXACT likeness; a perfect being fit for Union with God. AMAZING! Isn’t it? Read Philippians 2:5-11 in light of this revelation. After choosing to become and remaining human; God the father exalted Him to the highest place above every created thing. Remember God cannot be exalted or degraded, therefore this exaltation is of the man Jesus Christ who has chosen to remain like His creation forever. Today as you meditate on this, I pray God will give you revelation into the nature of the man Jesus Christ; to cause you to live in fascination and awestruck of he depth of His love. To see the value God placed on humanity in becoming one and remaining one, which means the value, He has placed on you. TIP: Remember, It is God who created the human frame; we didn’t choose to be made like this and so even though in our fallen nature we humans look so pathetic, perhaps through Jesus the man; we will catch a glimpse of the glory of a man. If God himself has chosen to take on the frame of a man; then man is so much more glorious than we know of or could even conceive of.